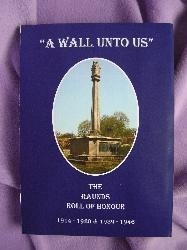 Our three books sold well at the Raunds Armistice Centenary event and although all are still available by mail order or bargain-priced on EBay, be warned that "A Wall Unto Us" and "Life Went On - Volume 1" may soon be SOLD OUT! Please see our "Publications" page for more details. See our "Publications" page for full details on how to obtain a copy. 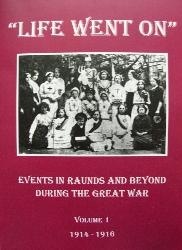 We are always looking for new stories, not just from WW1 and WW2 but also other conflicts involving Raunds folk and invite you all to submit suitable items to Steve or Andy for consideration. We will always welcome your comments on our website, you can do this either through an entry in our GUESTBOOK, or via an E-mail to Steve or Andy, all submissions will be gratefully received. Our original project was funded by the Local Heritage Initiative, a national scheme that helped local groups to investigate, explain and care for their local landscapes, landmarks, traditions and culture. The Heritage Lottery Fund (HLF) provided the grant but the scheme was a partnership, administered by the Countryside Agency with additional funding from Nationwide Building Society.